Over 700 sacks this past season at Wes’ Kitchen and still boiling strong! I’m the envy of the neighborhood. I live in Astoria Oregon and we catch our own Dungeness crabs and dig our own razor clams. And we have some local crayfish if you know where to look. I hooked up my new stainless Bayou Boiler to a natural gas line in my garage ……Flame on, baby. This thing is amazing. Rather than using some cheesy boiling kettle, I got a fifteen gallon brew kettle from Spike Brewing out of Wisconsin, filled it with water and salt. Now I draw a crowd of neighbors who marvel at how fast I can boil water. Being able to tone down the flame a bit is also a handy option. I can use the Bayou Boiler with a cast iron pan for razor clams. I could not be happier with the purchase. Looking forward to using this cooker for years to come. I highly recommend this product. AWESOME is all I can say! We boil 600lbs of peanuts a week and I have bought 2 of these! They work great and haven’t had an issue! We love these at OUR COUNTRY STORE in Andalusia Alabama! my friends in Canada are so jealous!!!!! Your burner is a huge upgrade/improvement over the one I had…you’ve got the best one on the market! Also, your customized burner ring is a huge improvement over the one I previously had even though each has the same number of jets. When set to maximum your burner growls with power and heat, while the other one I had never did that. Fried the New Year’s Eve turkey perfectly…getting ready now for crawfish season! Got it in 2 days. Spoke directly to owner of the company. Great unit. Highly recommend it. If you are reading this review because you are on the fence about ordering a Bayou Boiler, get off the fence and order one now. Can’t say anything negative about this boiler. Previously used a propane cooker, and after building a new house with natural gas hookups, I began the search for a unit that ran off natural gas. Ordered the stainless steel model and it’s a thing of beauty. Michael cuts no corners on these, and it’s built to last a lifetime. I stopped by the supply store and picked up an extra quick connect, and now I can quickly move my gas line from the burner to my natural gas grill in a few seconds. Used it for a shrimp boil this past weekend, and it worked perfectly. All of my buddies at the boil had never seen any burner like it, and all wanted to know where I got it. Michael was great to deal with, and quick to ship the order to make sure I received it on time. Well worth the money, and now I’ll never have to worry about running out of gas in the middle of a boil. Purchased two of these babies years back and they are awesome! Many fish fries and french fries with peanut oil with perfect holding temperatures. Oh yeah, wings too. Get yourself one. Just ordered my Bayou Boiler. Nice to call a number and speak to the owner/creator of the unit. I have waited a year as I worked on my outdoor kitchen. Now that is done and my boiler is ordered. Time to brew some beer and ready for crawfish season!! Just finished installing my gas line to my pad where I boil. Hooked up my Bayou Boiler to see how she would do. It’s gonna be awesome boiling with this unit!! Thank you Michael, I’ve been looking for something like this for a long time! I received my boiler 48 hours after ordering. Thanks for the quick & easy transaction. Setup and pressure testing was easy. Thanks for providing the tube of teflon thread goop. The burner made quick work of heating 10 gallons of mash water and boiling 10 gallons of wort for my American lager. No fuss whatsoever. My first impression is that the Bayou Boiler is BUILT LIKE A TANK and appropriately over-engineered. SO LONG PROPANE! Been nice knowing ya! follow up posting: 3rd year in use for frying. still loving it. now will use boiler to roast coffee. To everybody involved with the manufacturing of the product I just purchased: Good Job! It really does my heart good to see that old fashioned American workmanship still exists! Keep up the good work! You still make-em like they used to! Tomato sauce here. I’m sure if the price was a tad cheaper it would sell very well. No more propane!!!! Good luck! I am a maple syrup hobbyist tapping about 15 trees in upstate NY. After a few frustrating years of using a couple of propane turkey fryers I bought your boiler last year. Just finished boiling sap and I can tell you that the boiler is fantastic!! A lot cheaper to operate too! Just wanted to say thank you. The quality of this burner is unmatched. I have never seen a burner (propane or nat gas) this well built. I really wasn’t expecting it to be this nice. Michael – it works great!!! Thank you for getting it to me so quickly and easily, our crawfish party is next weekend. Great investment. I boil and fry every weekend. It’s so much more convienet to hook up and start cooking, instead of going get propane etc. It might take 2-3 minutes longer to boil but 100 times easier to use. Very well built and worth every penny. I highly recommend this product and the people that make it are over the top helpful. turkeys…. here comes your Freier…. I bought the Bayou Boiler 3 weeks ago. Since then I have made jambalaya , chili and hot wings. Next week we will start brewing a winter batch of beer. I cannot wait till crayfish season. This is an excellent product that is well made with many uses. I highly recommend it to anyone who enjoys cooking outdoors. Michael St. Romain is a true craftsman and a class act. Thanks, Michael, for the FANTASTIC advice on your Bayou Boiler. VERY well built and VERY sturdy. For the first time ever I was able to fry two very large batches of fries and the recovery was very quick. I’ve never had that many BTUs, until now. Your Boiler is THE BEST!!! For years I was using propane to boil my water for canning, cooking fish and fries. I could never regulate the heat properly and the fries and fish would never turn out as good as I would have liked them to be. Now, I have plenty of heat to spare and the fish I just did came out perfect. I highly recommend this boiler. I think Michael outdid himself with a perfect product with excellent sturdy construction. If you are on the fence about buying this, jump down and purchase it. I guarantee you will not be sorry. Thanks again Michael. Purchased this burner as a christmas gift for my husband last year, and all i can say is we both love it! It is easy enough for me to start it up on my own, no butane tank is wonderful and it works as well as descibed. When we first bought it we timed how long it took the water to boil and it was just over 8 minutes. Would definetly purchase again and we recommend it to everyone! I just ordered my second Bayou Boiler from Michael tonight. I am a brewer and use these to boiler around 10gals of water. Using propane pains me. I have 4 tanks I was constantly rotating out. Most likely I will be buying a 3rd boiler so I can have my sparge, lauter, and boil kettles are done with natural gas. So long propane and runs to the store to swap tanks! I’m way over due on this comment, I want all to know that I have (with Mike’s good guidance) converted an outdoor fryer to natural gas and life is even better. Great not having those tanks to worry about. My next project is a natural gas outdoor griddle and my outdoor kitchen is complete. This burner takes away all of the unpleasant work of boiling seafood. I can’t say enough about it except to encourage sea food cooks to try one and i am betting that you won’t be sorry. Mike was so helpful in assisting me in acquisition. I bought two bare Bayou Boiler burners from Michael and designed my indoor brewing system around them. The two greatest benefits of these burners is not having to deal with my junky old propane turkey fryer burner and running out of LP in the middle of a boil. Not having to worry about those things allows me to concentrate on the task at hand, making great beer. And one more thing, now I don’t have to stand around a boil kettle in the middle of winter and freeze my tail off to make beer anymore. 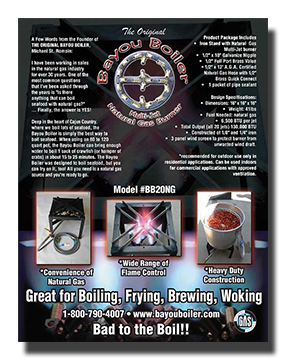 Just used my BayouBoiler to cook 97 lbs of chili, AWESOME ! The set up was easy and I’m looking forward to more cookouts. Now all I have left is to convert my gas grill to Natural gas. Ordered Saturday evening and received the following Tuesday. As a test, I boiled 6 gallons of water in my pony keg / brew pot and it only took 20 minutes. My old classic propane burner would take 45+ minutes and the tank was always running out at a bad time. This burner is worth every penny and more!! My first batch of brew will be called Bayou Brew !! I am a home brewer and this product saves me a ton of time. Awesome quality and construction. Love this burner. I have used it to fry and boil and everything turns out great. A great product made in America the Cajon way. Built to last, well thought out and executed. I am looking forward to many years of use. I had been trying to find a powerful outdoor natural gas burner for my wife without sucess until I found this great burner on Amazon.com. We have had it for two years. My wife just loves it. I just bought another one for my friend. 1. Very powerful. Excellent for cooking Chinese food. 2. Natural gas burns much cleanly and completely than propane. Woks are much easier to clean. 3. Natural gas come directly from a pipe connected from inside the house. Never need to worry about running out of gas any more. 4. Very strong stand with 3 panel wind screen to protect burner from wind draft. The paint came off the high-heat areas. I bought high-temp paint from Home Depot to repaint the high-heat areas. I was tired of waiting 45-60 minutes for water to boil on a regular stove burner whenever I was canning/jarring food. Now I can do the same thing in 10 minutes and never have to worry about running out of propane. A great product that makes life a lot easier. Next step: deep fried turkey! Big thanks to Michael for helping me find a vendor in Canada. Saved me the cost of shipping, duties, etc. Best thing since sliced bread. Have cooked chilli and boiled crabs with mine so far and am well satisfied with it. It is a very fine piece of equipment and Mike is a fine and honest man. I would recomend anyone to buy this product . It is so simple to operate and saves the back breaking task of fighting bottles of butaqne. Awesome, Awesome. My hobby is canning and jarring food. Bought this product because as a 40 something, single woman was tired of dragging around propane bottles or heating up my kitchen. Just tooooo easy. After I finish jarring my veggies, I boil seafood, unplug and good to go. I should have done this a long time ago!!! Just got my bayou boiler for Father’s Day. Looking forward to trying it out. My father in law has had his for about 7 years now and it’s just very convenient to have and not worry about propane. My wife said the man that makes them was very polite too, so that’s always a plus. I have been using the Bayou Boiler for over ten years. It is great for frying and boiling. Recovery time is quick when boiling multiple sacks of crawfish or frying several turkeys. Other benefits of using the Bayou Boiler include reduced cost of fuel (about 1/4 the cost of propane); low noise level; quick heat recovery. This is a great product. I was concerned I wouldn’t get the necessary pressure that propane gives you, but that is not the case with the Bayou Boiler. It is extremely well built and appears to be the type of product that will last a lifetime. A month or so after I received the product, I even received a phone call from the owner of the company to make sure I was satisfied with everything. I’m as impressed with the service as I am with their product ! I found this product searching online for gas boilers. Obviously, not having seen the boiler in person, it took a leap of faith for me to order it. Let me just say that it was the best decision I have made in a while. It is as advertised. I can now boil up crawfish, crabs, shrimp quickly and with ease. I can finally join my friends and guests at the table instead of wasting my time cooking batch after batch while they eat all my food! Even better, after my group of friends saw the boiler in person, it was a no-brained for them to order one themselves. Try it, you won’t be disappointed! The boiler is a winner! It was most definitely a conversation piece at my boil. It boils water faster than anything I’ve ever seen. My boil turned out wonderful thanks to Bayou Boiler. The best things since slice bread….. I just bought The burner 2 weeks ago. In just 15min. I had my 120qt pot boiling then closed the valve to 1/4 open and pot continued to boil… Dropped the crawfish in crank the burner up and with-in minutes back to a boil… The BEST PART is it very quet… I would say 3/4 less than my propane. If the boiler is anything like the web site its a sure winner.